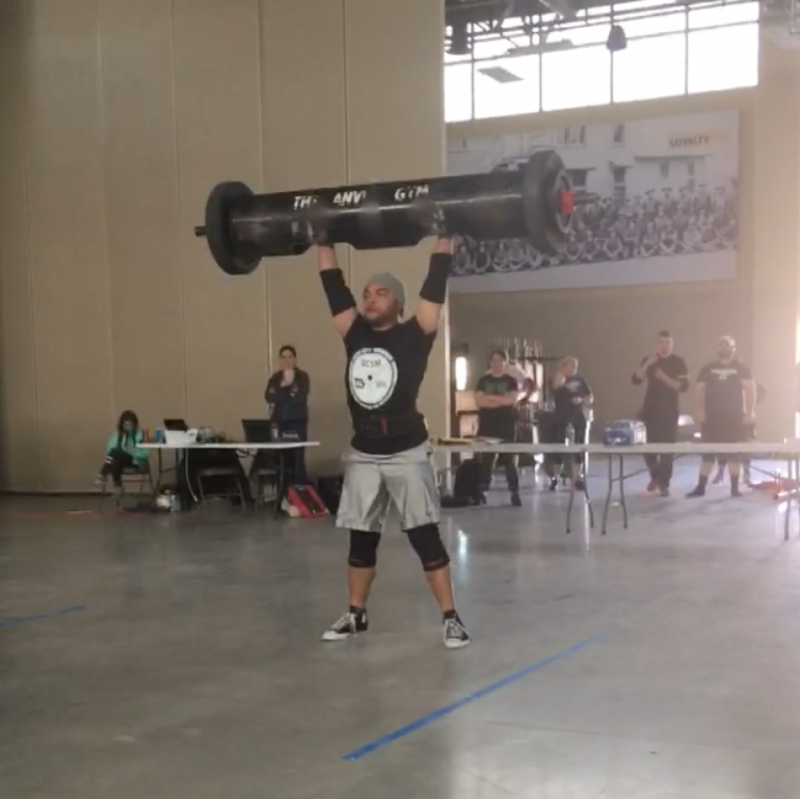 David Baxter competing in the log clean and press event, pressing 230 lbs. A reminder that stereotypes are just that, Pleasant Valley’s choir director is lifting much more than just stigmas these days. 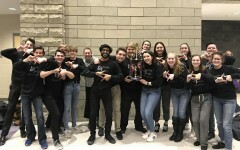 David Baxter, who became the director of Pleasant Valley’s nationally-ranked choir program two years ago, won the Anvil Gym Strongman March Madness competition on March 23. Baxter took first place in four of the five events, making him the champion of his division. 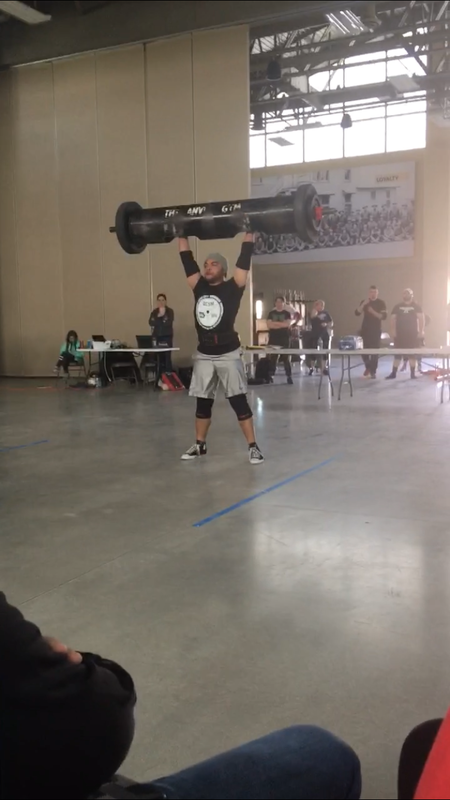 Events featured at this year’s competition were the log clean and press, progressive yolk walk, max height bag over a bar, carry and load medley and the car deadlift. These events challenged all of the muscle groups and required extreme amounts of strength and endurance from competitors. The progressive yolk walk, for example, is much like the FitnessGram pacer test PV students know all too well. Competitors must carry a weighted yoke across a twenty-foot area in 15 seconds while adding additional weight with each run. Baxter was motivated to start weight lifting when he auditioned for the role of Gaston, a burly male character from Beauty and the Beast, in his hometown theater. After his work on the production finished, he chose to continue following his routines and kept getting stronger. However, his success didn’t come without challenges along the way. In January of 2018, Baxter tore his bicep in his right arm. 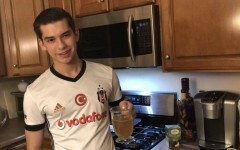 After surgery and months of recovery, he was able to train again, but it took him close to a year before he fully recovered. 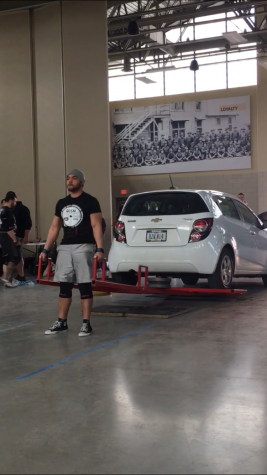 David Baxter dead lifting a Chevy Aveo along with an additional 150 pounds of weight for 24 reps.
Now, few physical obstacles stand in Baxter’s way, but the mental aspect of his fitness has become his priority.“There’s always that physiological barrier of having a re-injury, but some of those things you just have to power through and do it because you love what you do and have goals to accomplish,” he said. Baxter keeps friends, family, and students up to date with his accomplishments in the weight room on his Instagram account. Each photo and video is typically followed with the hashtag, #notbadforachoirteacher. Baxter acknowledged there are stereotypes that exist in his line of work as a male music teacher, but he enjoys being able to shatter them. Along with this, Baxter’s biggest hope is to prevent any stigma or judging among students who participate in different electives and extracurricular activities. Baxter has taken numerous aspects of choir and applied them to weightlifting, and vice versa. Body alignment, breathing and mind-to-muscle connection are a few he has been able to apply to both fields. 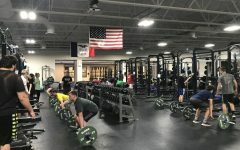 Most importantly for Baxter, he has been able to take his background in sports and weightlifting and use it to connect with students outside of music. His goal in doing this is to help people be recognized for all their abilities, hobbies, and passions. He wants students to feel empowered to do something similar. With his first place achievement, Baxter has qualified for the National Anvil Strongman Competition, held in Columbus, Ohio on June 8.